There is unlimited fun to be had on the many amusement rides and games during this year's Cobourg Waterfront Festival. 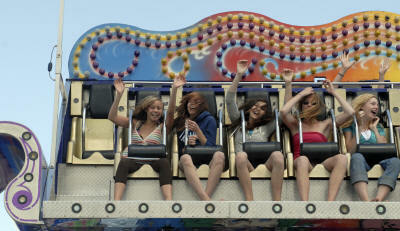 The carnival is moving this year to Victoria Park overlooking Lake Ontario and beautiful Victoria Beach. Ride one of the thrilling adult rides, put your young ones on one of the many children's rides, or try your luck at one of the numerous games. 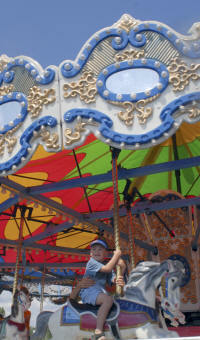 The carnival features rides and games for all ages, and of course popcorn, taffy apples and candy floss. Ride tickets are $1.75 each, 16 tickets for $25 or 26 tickets for $40. Each ride requires 1-3 tickets. The carnival offers a great view of Cobourg and the Festival. The midway will be open from 11:00 a.m. to 11:00 p.m. June 30th and 1st and until 6:00 p.m. on July 2nd.